With BPC Embedded and PAK customers have the possibility to create their own HANA enabled planning functions by using SQL-script. The possibilities for testing and debugging SQL-script procedures were not as sophisticated and easy to use as with ABAP. In order to be able to easily test and analyze the planning function code we have offered different possibilities to create a test environment for SQL-script planning functions. 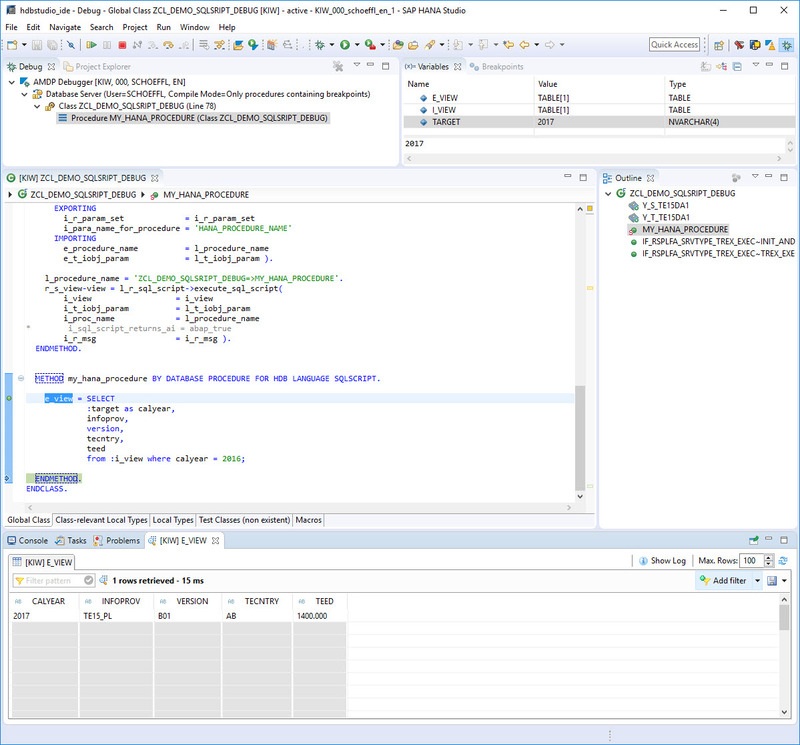 In order to debug the SQL-script you had to open the HANA modeler, start a debug perspective, set a break-point, and run the debugging procedure. 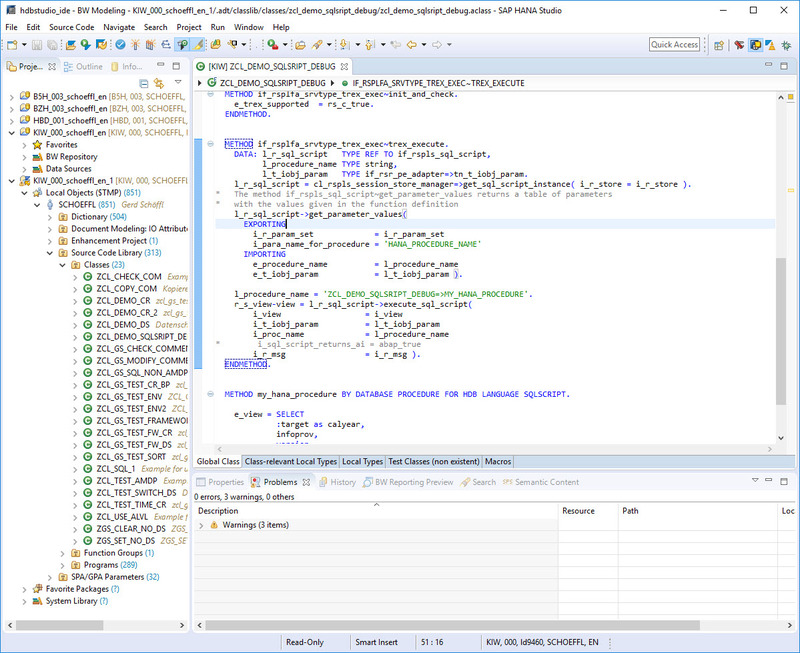 For each SQL-script you wanted to debug you had to create a new test environment with a new debugging procedure. It was not possible to debug entire planning sequences in one execution but you had to test each planning function individually. Then you should implement you planning function as an AMDP (ABAP Managed Database Procedure). That means you create the ABAP class that acts as a wrapper for the planning function and in the same class you create an AMDP method that contains the SQL-script coding. In order to create this class, you use the ABAP development tool. Once you are done with the coding create a planning function based on the new planning function type and either put it into a planning sequence or use it in any front end application (Analysis for Office or Design Studio). Now set an SQL-script break-point by simply clicking next to one of the SQL-script statements. As soon as you execute the planning function the system will stop in the SQL-script. Thus the break-point works in a similar way as an external ABAP break-point. You can now go ahead and analyze your coding. You can also display the content of each of the used tables (incoming data, outgoing data, intermediate views,…) and execute the SQL-script coding step by step. As you can set break-point in different SQL-script procedures you can also debug though several planning functions within one planning sequence. This technique is also very important when you want to analyze your SQL-script coding when you have implemented characteristic relationships or data slices in SQL-scipt.